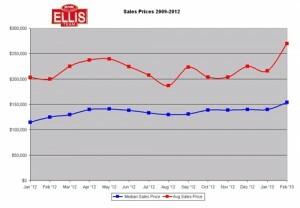 Data for January and February are in and we’re beginning to see signs that prices have risen the first two months of 2013. Single family median home sales rose from $140,000 both in January 2013 and December 2012 to $153,890. Median home prices were up 23.1% over last year’s median numbers. Emerging Data From Season Shows Price Gains. Average single family home sale prices also rose from $215,973 in January to $269,961 in February 2013. This represents a 35.3% rise over last February numbers. The average piece can be deceiving as a few large sales in the county can skew the numbers, so this tends to be more volatile. It is nice to compare both statistics to spot meaningful trends. 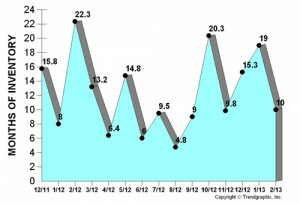 The average price was higher in December 2012 at $224,878 so you can see this number can bounce up and down just a bit. 60.27% of the home sales were paid in cash. Last year 66.13% were paid in cash so financing is rising slightly. 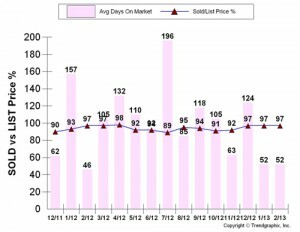 Listing inventory is down from last year’s levels. Pending sales are up over last year so we would expect inventory levels to be down in March once official numbers are released. The Ellis Team had a very productive and busy season, and judging by many of the agents we’ve talked to, others did as well. In fact, we’ve sold practically our entire inventory. We don’t even have enough to fill a page in the newspaper. With recent price gains many are surprised at how much they are able to get for their home today versus just one year ago. Of course, there are some that didn’t realize just how low prices were a few years ago, so when they read news headlines they believe their home shot up more because they’re using a higher baseline. It’s important to keep in mind that not all homes appreciate or depreciate at the same rate. Certain communities fare differently than others, as do homes with varying features such as waterfront, etc. For the first time in awhile we’ve begun to see SW Florida residents making up/down and lateral moves. We saw so little of this because so many were upside down on the mortgages they couldn’t afford to sell even if they did wish to live in a different type of property. With the rising prices it is freeing some up to make the move they’ve been thinking about for a few years. Some residents have felt trapped in their homes because of the values. The chains are beginning to loosen. Although it will be awhile before everybody is out from those chains. Some people can afford to sell but just don’t like the prices today. They’re still not where they were at the height and may not get there anytime soon. However, if you’re selling today and purchasing another, chances are you’ll make out because its value is much less today than it once was too. Whatever your situation is, it pays to consult a Realtor that can help you fairly identify your value. If you under price your home you just give your equity away. If you overprice it, you’re making decisions based on a false premise and that could bite you in the end. As Realtors we are inundated with new programs by 3rd party vendors selling us on their ability to do this, syndicate that, or make us more productive somehow. Literally there are thousands of tools available so sometimes it gets a little tough, especially for new Realtors to muddle through all the stuff to find out what works and what is a waste of time or money. New Trend Reports Available. Some of these tools are free, and some cost thousands. To my way of thinking, even if it’s free, if it doesn’t save you time or promote your properties effectively it’s a waste of your time, and as a Realtor, time is the only thing you have. Once you give it away, you can’t get it back, so why give it away to technology programs? And if it costs thousands, it had better work. While being bombarded by outside vendors sometimes it’s easy to ignore tools available within the MLS system. I found such a tool today I’m guessing most Realtors know little about. I think it’s new since I watched a video on it but I hadn’t heard of it before. It’s called Trend Vision. The way it works is a Realtor can ask for reports based upon simple criteria. 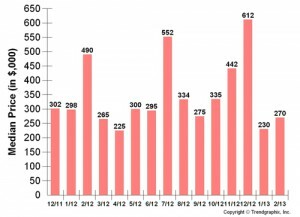 For instance, let’s say I wanted to know what the trends were for Town and River waterfront property in the last year. I couldn’t drill down to just Town and River, but I was able to ask for data on only waterfront properties priced $150,000 and higher in 33919 zip code. Technically this could include lakefront properties in Whiskey Creek and a few other places, so it’s not a perfect report. I can also search by MLS Geo Area instead of zip code. When finished the system automatically produces nifty reports. The Realtor can select the time frame. In this example I selected Dec 2011 through February 2013 or roughly the past year. Any given month can skew results with so few being sold in a given criteria per month, but generally you may be able to make out some trends. This is helpful because overall LeeCounty numbers don’t tell the whole story, or what’s going on in your neck of the woods as the Today Show weatherman might say. At least this drills down to a local level. Agents can select properties by type, or even single out short sales and foreclosures. While I haven’t figured out how to drill down to the neighborhood level, this may be helpful in spotting overall trends in a given geographic area. As a Realtor I can easily spot the holes in relying on a report as Gospel truth, there can be some knowledge gained when using this as an additional tool combined with other reliable data. If you’re a Realtor, check it out and let us know what you think. If you’re a customer, you might ask your Realtor to pull some reports for you to see if it brings clarity to your situation. If you have a property to sell and want to make sure you price it right, give us a call. 239-489-4042. If you’re a buyer, it pays to know the market and the trends. Call your Realtor, and if you don’t have one yet, give us a call.